Our Glass Bead technology is the finest in the world. Uniquely designed and precisely manufactured in our plant, at a lower price point than our competitors. 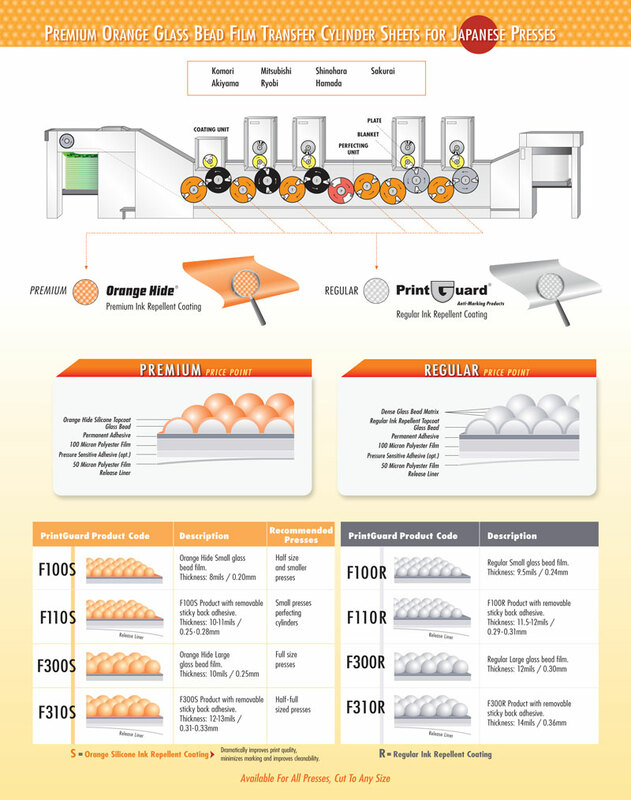 For Heidelberg presses, our Premium jackets are designed and manufactured with Printguard Patented features such as Secure Safe ™, Microcellular and Fabric backing and triple coated silicone coatings. 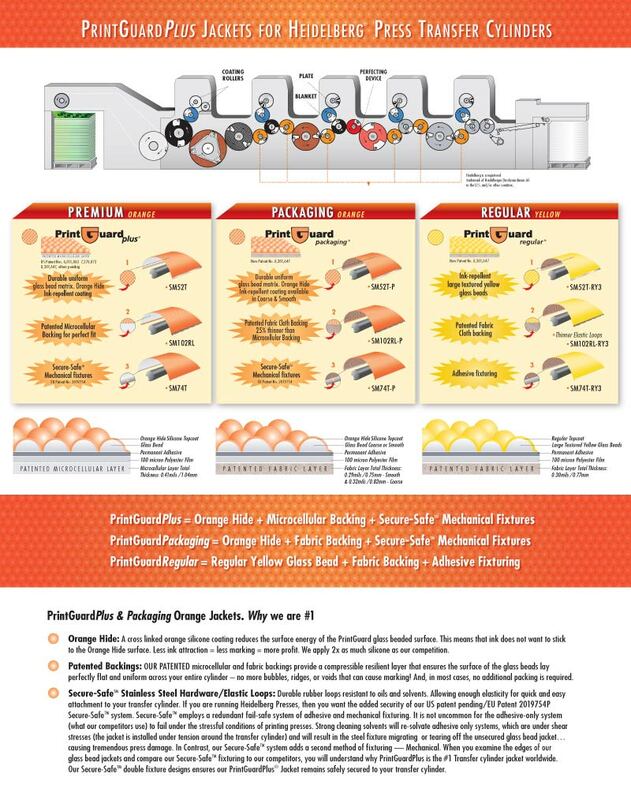 For Japanese Presses, our Glass bead film is offered in Premium Orange Hide ® and Regular, adhesive and non-adhesive backed in both large and small glass bead matrix to accommodate all press formats. 1) I have a 5 Color SM74 and print mostly board and carton stock, what do you recommend for antimarking jackets for the transfer cylinders? For board/carton stocks we recommend PrintGuard Packaging jackets, product code SM74T-P. These are 33 mils thick, have an excellent price point and will support printing these heavy stocks without marking. 2) I purchased a PrintGuard jacket for my SM102 press, what is the best way to clean and maintain the jacket? For best results, use an absorbent, lint-free cleaning cloth moistened with a mild water based/miscible press wash, diluted 50% with water. Use uniform light pressure to remove wet ink. Check “Antimarking Products” on this site for jacket installation, care and maintenance instructions. 3) We have a GTO52 and an MOV26 press, how do we determine the optimal size of the Antimarking jacket? Check the how to measure instructions for GTO52 and MO26 in the “Antimarking Products” section on this site. 4) Why should I switch from Paper to Film? Paper is alive, shrinks and expands with humidity and cannot be washed, glass beads fall off. We recommend our F100R/F300R (Regular small and large glass bead film) Textured, uniform glass bead size, easy to clean, glass beads permanently bonded to film with mild ink repellent.